FOX Sports 1 has been on the air for nearly three years and you probably still don’t know its channel number. So after failing spectacularly to compete with ESPN on news via its SportsCenter clone, “FOX Sports Live,” FOX has pivoted to compete with The Worldwide Leader on debate. Fittingly, the man leading this charge is Jamie Horowitz, the former Bristol executive credited with ushering in the “Embrace Debate” era at ESPN five years ago. Horowitz has therefore spent his first 13 months as FOX Sports’ National Networks president pilfering on-air talent away from his former employer — namely, Colin Cowherd, Jason Whitlock and imminently, Skip Bayless. While FOX has been widely panned for these moves that one sports media executive described to me as “the molten lava of hot takes,” Horowitz believes he has to look no further than a sister station to prove his plan will work. Horowitz’s plan sounds great in theory and it worked for him before. But by simply trying to recapture the ratings spike “First Take” experienced after turning into a full-time debate show, Horowitz’s big bet on debate fails to understand the biggest reason why Fox News has been so successful and shows why FOX Sports 1 is again doomed to fail. The biggest reason Fox News is such a success is not just that it is “provocative and opinion oriented” — it’s because CEO Roger Ailes identified a massive gap in the marketplace when the network launched two decades ago. At the time, it appeared there was far too much competition in the news space for FOX to succeed. There were already the newscasts at the Big Three networks — NBC, ABC and CBS — plus the wildly successful CNN and the launch of MSNBC just months before Fox News hit the airwaves. But Ailes saw what all five of them had in common: a perceived liberal bias. As a result, Ailes brilliantly recognized that they were all fighting for pieces of the same pie with a liberal audience while nobody was directly serving conservative viewers. Fox News became the voice of the right during the Monica Lewinsky scandal in 1998, as ratings jumped 400 percent. Then Fox News rode the new wave of conservatism ushered in by George W. Bush’s presidency and post-September 11thAmerica to surpass CNN in the ratings by 2002. Now two decades after it launched and was given little chance to succeed, Fox News nearly doubled CNN’s ratings and tripled the viewers of MSNBC in the first quarter of this year as the most-watched channel on cable — including ESPN. The lesson should be clear: In order for FS1 to compete with ESPN, first find a void in the marketplace that ESPN is not serving. The opportunity is certainly there as many sports fans have come to view ESPN as an evil, soulless corporation of mindless debate and tired shtick. That’s why so many on the Internet cheered with glee every time Bill Simmons blasted one of his colleagues at ESPN or the network itself and they tweeted “#FreeSimmons” after he was suspended for appearing to even dare his bosses to punish him for calling Roger Goodell a liar. As I’ve said before, upstart sports networks such as FS1, the CBS Sports Network and NBC Sports Network need to stop trying to out-ESPN ESPN and instead build the anti-ESPN. But instead of learning from its failed initial strategy, FOX Sports 1 is now just going to regurgitate the same daytime debate with the same people with a fraction of ESPN’s platform. 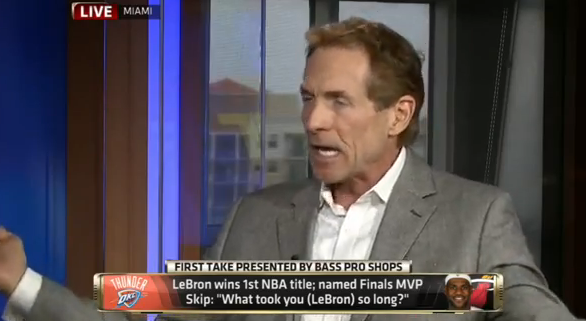 Here are the two million-dollar questions: How many “First Take” fans are going to actually find FS1 on their channel guide to watch Skip Bayless and Shannon Sharpe debate the same issues as Stephen A. Smith and Skip’s replacement on ESPN? And how many people are going to go straight from ESPN’s debate-filled daytime TV schedule or skip it entirely to instead watch Cowherd and Whitlock with the exact same format as “PTI” a half-hour before it? Judging by the dismal ratings for “The Herd” so far on FS1, my guess is not many. If FS1 truly followed Fox News’ blueprint, it would position itself as the ESPN antithesis in one of two ways. Embrace the trend of advanced analytics and film study that have made websites like FiveThirtyEight, Smart Football and Pro Football Focus successful, billing FS1 as the network for smart sports fans. Instead of talking heads screaming about why the Cavaliers are better without Kevin Love, fans could actually watch experts analyze game film and break down the difference between Game 3 without Love and Games 1 and 2 of the NBA Finals with him. I’m not sure how big the audience would be for that, but at least FOX would be offering something unique and premium. Follow the path blazed by the likes of Bill Simmons and @PFTCommenter with a blend of sports, pop culture and snark that appeals to a young audience. While Barstool Sports can be very controversial, its wildly popular “Pardon My Take” podcast hilariously mocking ESPN’s debate shows — and recently touring the country for “Grit Week” — is a perfect example of what FOX Sports 1 could be doing. As these three have shown, the audience for this kind of content is massive..
Katie Nolan fits this mold and should be the template and face of the new FOX Sports 1, but she’s still stuck airing at midnight on Wednesdays. Clay Travis does quite a bit of humor and pop culture for his site, “Outkick the Coverage,” but Travis is overly crass and has now turned much of his attention to leading the “anti-PC Bro” movement with Jason Whitlock; fighting “PC bros” is certainly different from ESPN, but how many people want to be beaten over the head with conservative social commentary from their sports network? Pingback: ESPN exec fires back at FS1: "They have made a big mistake in abandoning journalism"